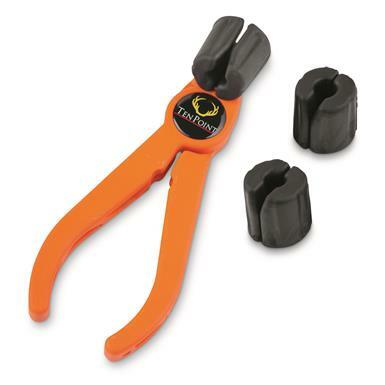 The TenPoint® Bednar Perfect Puller is the quick, easy way to remove arrows from your high-density archery target. Bednar Perfect Puller includes 3 interchangeable grippers for use on different diameter shafts. Works with both arrows and crossbow bolts. TenPoint Bednar Perfect Puller is rated 4.5 out of 5 by 29. Rated 5 out of 5 by Texas4426 from Works good Works pretty good, it isn’t easy pulling a barried arrow out of a Target, but this helped. Wood like to see metal pliers with finger groove grips though. Can get a little slick when it’s hot out and ur sweating. Rated 5 out of 5 by Johnc1956 from Great tool Great arrow puller. Especially if you have some arthritis in your hands. Rated 5 out of 5 by Spook from Bednar Perfect Puller. I have a Ten Point Stelth XLT Crossbow. It shoots hard & fast. The only way I can pull a arrow out of the target , I have tried several, is with these awesome pullers . Can not remove the arrow with out it. Love them. Rated 5 out of 5 by Parker1 from Best target shooting friend you could have. I was at the ATA show when I came across the ten point booth. After several minutes of talking to the gentleman at the booth he gave me a Bednar arrow puller. My brother was with me and asked what the guy gave me. I told him, I probably just got a piece of junk arrow puller that they probably could not sell so they were giving them away. We laughed and I thru it in my bag. Several weeks later I was shooting at my block target, If you ever shot at one you know the arrows are hard to get out. I remembered my free gift I got. I ran in the house and grabbed it. Boy was I really suprised, the arrows came out with ease. It's the handiest tool I've ever seen to remove arrows. It's light weight, strong, grips and pulls the arrows right out. Rated 5 out of 5 by Rascal1953 from Best puller I’ve usd. My crossbow shoots around 360fps with 20 inch bolts and I shoot at a high density crossbow targe. The bolts go into the target about 70% of the way making it very difficult to remove them. The different rubber grips on this puller gives me the best grip on my bolts when removing them. Most pullers will not work as they damage the fletching. No problems with this puller. Switch rubber jaws in a matter of seconds to accommodate arrows. Rated 5 out of 5 by Maxairedale from GREAT TOOL TO HAVE I purchased the arrow puller for pulling arrows out of 3D targets because I'm losing grip strength. I found that the puller is also very handy for changing nocks and extinguishing lighted nocks. Rated 5 out of 5 by Anonymous from Easy of use for a 12 year old Absolutely one of the best arrow pullers I have ever used. I was hesitant about the plier style at first but it feels good and pulls bolts effortlessly. The previous pullers that have had my 12 year old son was unable to use but with the Bednar puller has has no problems retrieving his bolts now. Rated 5 out of 5 by One Shot Al from Arrow "Saver" Greatest arrow extractor I have ever owned! Grips the shaft using the different size rubber grips - squeeze the handles and pull the arrow out of the target.